Welcome to the Stamp Review Crew: Mosaic Madness Edition! We are excited to share ideas with you for using the Mosaic Madness stamp set. And, frankly, I am really looking forward to seeing what everyone has created! As you just saw, I chose to pair up the Kinda Eclectic stamp set with Mosaic Madness. When creating a series of cards to display together, I love to create with a common color palette. For these cards, the palette contains Blackberry Bliss, Pool Party, So Saffron, Old Olive, and Sahara Sand...what a sweet five color combo! The background on the Whisper White was created using my Sahara Sand and Pool Party ink pads...can't get much easier than that! The speckling effect comes from very lightly stamping on the Sahara Sand. You can really make out the shape of the So Saffron ink pad on this card front! Notice the starburst in the middle of the punches out mosaic shape? I had done a bunch of random stamping and that is simply where the patterns ended up merging. I'm loving how different the shades of Blackberry Bliss look on the Whisper White and then stamped off onto the So Saffron...almost looks like two different colors but alas it is just one! What do think the mosaic mounted on an angle? My vote is that it looks whimsical...perhaps you agree! It is askew because I decided to align the Pool Party ink...that is the real reason it is tipped to the side! 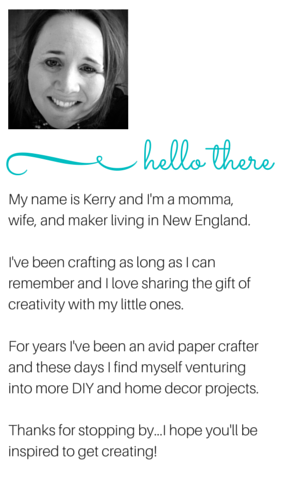 Thanks for stopping by Peonies and Paper Chains -- enjoy the hop! The Stampin' Up! Holiday Catalog is live and I'm confident some of you are enjoying the Visions of Santa stamp set and the coordinting Santa & Co. Designer Series Paper. I definitely think that they are fun! I don't have the stamp set, but I do have the paper and it is most definitely adorable! The pattern on the paper felt reminiscent of the chevrons and the snip of ribbon seemd to echo the triangular element. Be sure to visit the Pixel Maven's DigiChallenge for more inspiration and be sure to play along with us! Hope today's color combo and project will inspire you to carve out a little time for creativity during the holiday weekend! It's Here! The Stampin' Up! Holiday Catalog! It's here, it's here! 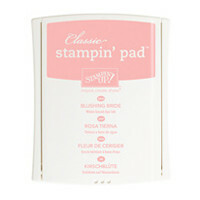 I know many of you have been anxiously awaiting the arrival of the Stampin' Up! 2014 Holiday Catalog -- it is live and you can order from it today! One of the things I love to do is download the PDF to my tablet so that I always have access on the go. Do you do this too? FINAL DAY -- SHORT & SWEET STARTER KIT OFFER! Ends today, August 28! Purchase the Starter Kit for $99 and get $150 in product. YOU CHOOSE: Up to $150 worth of Stampin' Up! products (any current catalog, clearance, the new holiday catalog, specially priced bundles--if we sell it, you can include it) in your kit. That's $51 in FREE product. HOLIDAY SHOPPING! Select products for your Starter Kit from the just released Holiday Catalog! FILL YOUR WISH LIST: Enjoy a 1 time benefit of 30% off your first product order of $150 or more (placed within 45 days). 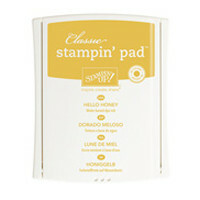 Stock up and save on your favorite paper, stamps, inks and tools PLUS earn more free product. EVERYDAY DISCOUNT: You'll receive a minimum of a 20% discount on anything you purchase while you remain active. Receive FREE catalogs and an opportunity to preview and PURCHASE NEW PRODUCTS IN ADVANCE--this is my favorite demonstrator only perk! EARN EXTRA MOOLA! Stampin' Up! offers a fun opportunity to share your passion for stamping and earn extra income. The choice is yours! TEST DRIVE. Take advantage of Stampin' Up! demonstrator discounts and benefits through January 31, 2015. There's no risk, no obligation to make additional purchases, no requirement to host workshops or parties and no penalty to drop if you do not reach $300 in sales by the end of the first FULL quarter! IT'S EASY! Click here to purchase your Starter Kit through me. The stars are popped up with my favorite adhesive -- Stampin' Dimensionals. This project made good use of my Big Shot die cutting tool along with my Stars and Ovals Framelits. And, just as much as we are counting down to the launch of the Holiday Catalog (it's tomorrow! ), the count down is on for the end of the Big Shot Bundles promotion. It is quite the amazing deal -- don't miss out on your opportunity for your free or reduced price bundle. Details here. Pretty Stripes and a Big Howdy! I'm loving the stripes on this wrapping paper, how about you? The wrapping paper comes 2 rolls per pack and includes two different patterns...I'll have to show you the other pattern soon! Ultimately I decied to create a flat card for Max and it is precisely what you see on the top of the package. Our birthday message is written on the back and the I'm crossing my fingers that the Washi tape will come off without ruining the card front! It was a fun package to create and we hope that Max will enjoy the contents! FINAL DAYS! The Stampin' Up! Big Shot Bundle promotion ends on August 31! Don't miss out on your opportunity for your free or reduced price bundle. Details here. When I first flipped through the Stampin' Up! Holiday catalog at the Inspire.Create.Share. event in July, one of the kits that instantly stood out to me was the Frightful Wreath Simply Created Kit. I love Halloween and I love wreaths...this was the perfect kit in my book! The spider web goes all the way around the wreath and the jumbo rosette fills the middle of the wreath. Apparently I managed not to photograph the entire wreath so you do have to use your imagination today! I wanted some pops of color around the wreath and used the Tangelo Twist ribbon that comes with the kit and a bit of Black Chevron ribbon to do so. I simply folded the ribbons and attached to the wreath using T-pins. Since I did not love seeing the shiny T-pins, I used Glue Dots to add buttons over the pins. One of these days I will find just the right spot for taking wreath photos...as much I love making them and they look great in person, the lighting is not always ideal for taking pics of them. If you and a group of friends love Halloween, these wreaths would be fun to make together! Start to finish the wreath (including making the beaded spider) takes less than an hour to assemble...if that is your sole focus! Add in a bit more time for some chatting and snacking with friends. Should you need a wish list to keep track of what you'd like to order from the holiday catalog (it goes live on Aug. 28), click here to find a printable one! When it comes to kits, are you apt to follow the instructions precisely or veer off in a different direction? The ultimate Stampin' Up! kit is is the starter kit and until August 28 only, you can select up to $150 in products for just $99 plus local tax! This is $25 more in products than usual and the kit ships free. There's no requirement to host a workshop or even to place another order, however you will be eligible for discounts on every purchase you place until the end of January 2015! Learn more about the perks of purchasing a kit. $51 of FREE Stampin' Up! Products and a Frightful Sneak Peek! Happy Friday, friends! lots of things to share with you today! From August 21 to 28 only, Stampin' Up! is giving you a chance to receive up to $51 in FREE products when you purchase a starter kit! Select up to $150 in products and pay just $99 plus tax! How cool is that?! This is the perfect time to stock up your craft room! Oh, and one more thing, you'll enjoy a discount on your Stampin' Up! purchases until the end of January 2015! Very cool, indeed! Click here to learn more or to purchase a kit today! These completely cool bags will be in the September Paper Pumpkin Kit! And, when you join by September 10, you'll receive your first two kits for 1/2 price! This offer applies only to Paper Pumpkin subscriptions that you order through the My Paper Pumpkin site. Sign-up today! Note: The sentiment stamp shown is not included; purchase it in the Kinda Eclectic stamp set. The spider was so much fun to assemble and I promise that it was easy! You'll see the rest of the wreath on Monday! What do you think so far? Polar Bear Peek for PPA! Stampin' Up! 1. The Bearing Gifts single stamp (don't you simply adore the polar bear with the children on its back?). 2. Sentiments from the Endless Wishes photopolymer stamp set. 3. The new All is Calm Speciality Designer Series Paper -- the top third shows the original paper and I brayered some Pool Party ink onto the bottom portion. 4. The very fun Frosted Sequins (please don't tell anyone, but the sequins on the polar bear are covering up an ink smudge...oops!). As always, I cannot wait to see what my fellow design team members have created! And I do hope that you will play along with us! Be sure to visit the Pals Paper Arts site for additional inspiration and for challenge details! I'll be sharing another sneak peek project tomorrow...be sure to stop on back to see it! Let the Stampin' Up! Sneak Peeks Begin! Lots of you are anxious to see projects from the holiday catalog (it goes live on August 28)...your wish is my command! From today until it launches, yo'll be see fresh, fun, and fabulous ideas for using holiday catalog products! 3. A super easy to use Handheld Stapler with Mini Silver Staples -- note that the stapler and staples are sold separately! 4. A beautiful rounded edge Note Tag Punch that will be just right for your tag making needs. The punch is available in a bundle with an adorable set of 5 tag making stamps. I'm thinking you just may need a wish list to keep track of all the items you'd love from the holiday catalog -- click here for a printable wish list! Which item -- stamps, stapler, sequins, or punch -- is a must-have on your list? Please share by leaving a comment! If you say all of them, I completely understand! As a reminder, these sneak peek items are available to customers beginning August 28 and are available right now to demonstrators! One of my favorite demonstrator perks is the ability to get products early so I can start playing with them! Don't Miss Your FREE Bundle! The Stampin' Up! Big Shot Bundle promotion ends soon! Don't miss out on your opportunity for your free or reduced price bundle. Details here. Hip Hip Hooray...it is Tuesday! And that means new weekly deals! Hip Hip Hooray...holiday catalog sneak peek's start tomorrow! So excited to share them with you! Happy Tuesday, friends! However you spend your day, hope it is filled with something that makes you want to say "hip hip hooray!"